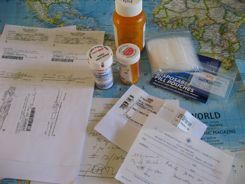 "It's a relief to know packing medications is not a problem. The "official sites" are confusing. Thanks for making it understandable!" We're often asked if you are allowed to take medications in your carry-on luggage. We've always said don't check anything you can't afford to lose. So how do you pack your medication and get it through security? There are a few rules to follow when packing medications for air travel. Let's go through this... it's really simple. The U.S. TSA and government security agents in other countries will allow all prescription and and over-the-counter medications. 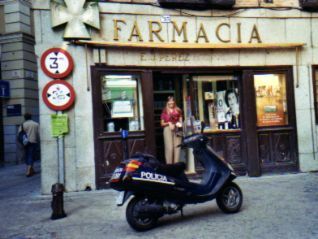 We always say that you can get anything you need almost anywhere in the world... as we did at this Farmacia in Spain. USUALLY, but not always... and who wants to deal that on vacation if you can avoid it? We also tell you to pack enough medication to get you through your trip and a few days beyond. Mark gets questions from travelers all the time, especially during holidays and peak travel seasons. Let's get a little more specific for you... answer some of the questions we've seen. What We Fit In Our Plastic Bag? Think about it... Pills are not a problem as they are not liquids, creams or gels. This includes your prescription pills as well as aspirin, cold tablets, vitamins or whatever. The general rule for pills is that you should pack as much medication in pill form as you will reasonably need for your trip... or in government speak "a quantity essential for your trip." Some medications are liquids. You are permitted to take them in your carry-on luggage. No Limit Well, within reasonable limits. The TSA and other agencies do not limit the amount or volume of these items... you can take more than 3.4 ounces or 100 ml. You must declare them to the government agent at the security checkpoint. plastic bag besides liquid prescriptions? It's not strictly necessary to make a list of your medications, but if you have a lot of meds it's a good idea. We've made up a sample form to declare medications that you can carry with you. Same thing applies to medications that are gels or creams. Pack what is medically necessary in your carry-on luggage. If it is less than 3.4 ounces or 100 ml, we often just put them in our one quart plastic bag. If they won't fit, pack them separately in your carry-ons, but declare them. Face creams and sun screens are not considered medically necessary as a general rule... they will have to go in that bag and be under the 100 ml limit. What creams and gels are allowed? Gels or frozen liquids needed to cool items used by passengers with medical conditions. Inhalers are considered medically necessary. They are permitted. Remember, if these medications are more than 3.4 ounces or 100 ml or they are outside of your one quart plastic bag, you must declare them to the agents at the security checkpoint. You should be able to prove that they are your meds. To see what screening process may take place check the TSA site. If you are flying out of the UK and some other countries, the allowance for packing medications in your carry-on luggage is for a "quantity essential for your trip". They are still encouraging passengers to carry on only small necessary amounts of liquid or gel medications and pack the rest in checked luggage. If you must do this, remember to make sure that bottles and tubes are tightly closed when packing medication. Wrap them in zip lock plastic bags and make sure they are cushioned by your clothes. Of course, that's a good idea whether it's in checked OR carry-on luggage. Prescriptions of all types whether pills, liquids, sprays or creams are best packed in their original, labeled containers. The name on the prescription should be yours and match your passport and ticket. This is not a requirement, but it could save some trouble with the TSA or customs in another country. The TSA also recommends that you bring along a letter from your doctor or some sort of supporting documentation for the medication you need to carry on. Having said this, we do combine our pills in pouches or smaller containers, and we have never had a problem... we do carry copies of all of our prescriptions. 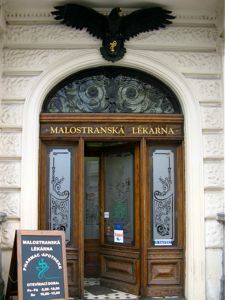 If anything gets lost or broken, you can get the prescription filled at your destination. 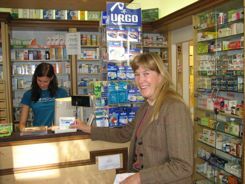 On our international travel health tips page I told you that pharmacists everywhere are very helpful. Carry prescriptions for your glasses as well. I mean, you don't have to declare your glasses, but it is a a good idea to have a spare pair or your prescription. In case you break them, you can get them replaced if necessary. 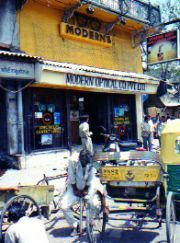 We only needed a quick repair at this Optician in Delhi, India. Having that written copy of your prescription and getting your own medication sure beats trying to get something whipped up by the local medicine man. 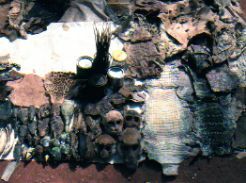 While many of our modern medications may have come from the wild, llama fetuses in Bolivia and monkey skulls in Mali will probably never take the place of your pills! Got your attentions didn't I? We take this seriously, and you should too. You want to stay healthy. Hopefully packing medications carefully and in compliance with the new regulations will keep them from getting confiscated or broken. Being prepared in case something happens will let you get medications replaced if you have to and get on with enjoying your trip. If it does come to getting your medications replaced, ask at the airport information booth or at your hotel about pharmacies. ...or have a green cross or the symbol of a mortal and pestle. Use some common sense and imagination... the words or symbols DO tell you what's inside. 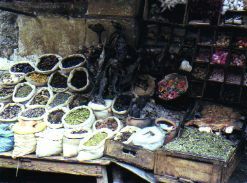 The shop may look old with antique counters, walls of drawers with enamel plaques on them and bottles of dried herbs, but there will be modern medicines available. This is just a general guide to packing medications in this new world of travel with heightened security. Check with the Transportation Security Administration website for the latest, full and complete description of items which are permitted and which are prohibited. We'd rather you could carry all of your medications with you, but if you can't... follow these tips and all in all, packing medications for your international trip or for domestic travel with the latest security alerts in mind won't be so bad. Packing Your Cosmetics What Can You Fit In That Plastic Bag?